Arizona State University is preparing young scientists to improve environmental sustainability, health and economic development through social entrepreneurship. Twenty-four young scientists from Lower Mekong countries, who are enrolled in or have recently completed a graduate program in the fields of water, energy or environmental sustainability, participated in the inaugural cohort. They developed capacity for collaborative research through a four-week thematic exchange program, a two-day scientific symposium and a competition for seed funding. Since 2010, the Fulton Schools have partnered with the U.S. Agency for International Development and Intel Corporation to revolutionize engineering and technical vocational universities as part of the Higher Engineering Education Alliance Program. Additionally, the BUILD-IT Alliance has created a world-class model to advance university autonomy and instructional quality. “The program is designed to build a regional community of emerging researchers who acquire technical knowledge by focusing on developing their interpersonal skills through team-based activities, classroom discussions, group presentations and applied research fieldwork,” said Jeffrey Goss, the associate vice provost for Southeast Asia programs in the Fulton Schools. 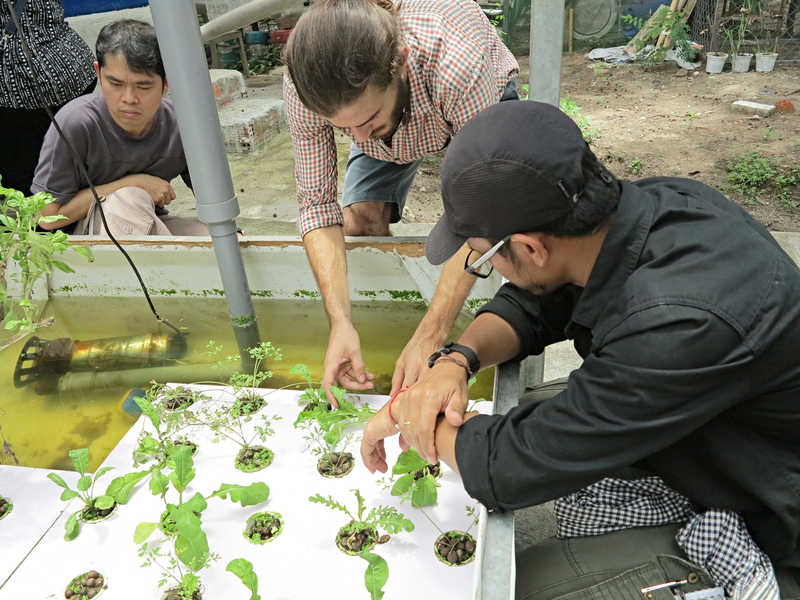 The researchers kicked off the program with a summer exchange experience hosted at the Ho Chi Minh City University of Technology and Education in Vietnam. The participants attended skill-building workshops and learned how to apply those skills toward research initiatives and technology development to create meaningful impact for the region. The first cohort of early career researchers had the opportunity to attend and present posters on their applied projects at the program’s first symposium at the Lotte Legend Hotel in Ho Chi Minh City, Vietnam, on Dec. 13–14. 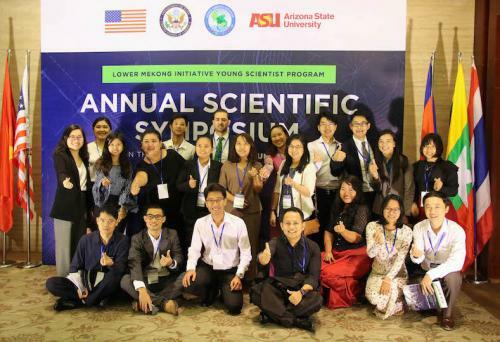 “Through the Lower Mekong Initiative Young Scientist Program, we’re building a network of scientists who devise innovative solutions to cross-border environmental challenges faced by the countries of the Mekong region,” said Deputy Consul General Tim Liston, of the U.S. Consulate, Ho Chi Minh City. The young scientists’ applied projects included an eco-floating farming system for the Tonlé Sap lake in Cambodia, an app for monitoring energy consumption in homes and a play pump water filtration system for schools in rural areas. “While their solutions to problems were innovative, the main goal of the program was to teach teams the value of working together across disciplines and countries to accomplish a shared goal," Quiroga said. Phetrak will continue his studies this year as a visiting researcher at ASU where he’ll work with Regents' Professor Paul Westerhoff on water and wastewater treatment technologies, such as physicochemical treatment processes. A team-based classroom activity with participants from Laos, Myanmar, Thailand and Vietnam. A certification ceremony during the last day of the Lower Mekong Initiative Young Scientist Program at the Arizona State University Makerspace in Danang, Vietnam. Participants from Myanmar, Laos, Vietnam and Thailand give a presentation at Arizona State University’s distance learning studio at the Ho Chi Minh City University of Technology and Education. 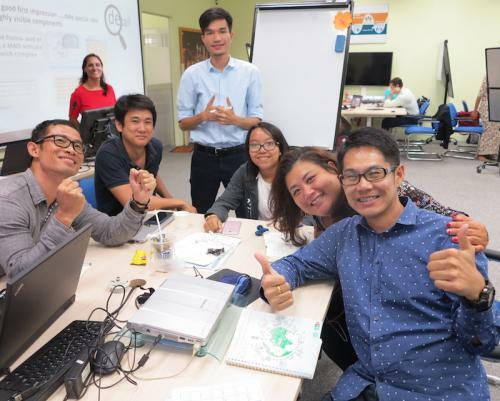 Young scientists from Vietnam and Laos enjoy an applied project brainstorming session with Evergreen Labs at the Arizona State University Makerspace in Danang, Vietnam. The Lower Mekong Initiative Young Scientist Program’s inaugural cohort pictured outside the Arizona State University Makerspace at the University of Danang. “We’re really excited to support the Lower Mekong Initiative Young Scientist Program through the introduction of the Wiley Researcher Academy, specifically designed to help early career researchers realize their potential as published authors of high-impact scholarly content,” said Ben Townsend, vice president of global library sales EMEA and APAC at Wiley. “This program can be considered as a bridge, which connects many young scientists and researchers with a firm connection,” Phetrak said.